﻿ Chicks in Bowls - Not Here to Flirt Patch - $9.00 : Bruised Boutique, For Derby. By Derby. Customize your favorite denim jacket, overalls, shorts or skate bag with a patch that packs a punch. 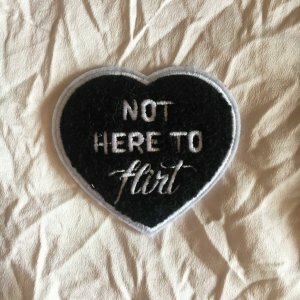 We’re not here to flirt. We came to skate! This patch is designed to be ironed and/or sewn onto fabric. Please be careful when ironing onto synthetic fabrics.